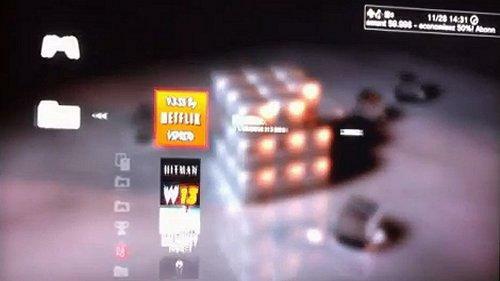 Hi, I just want to let you know That I have made a Netflix for PS3 CFW 3.55.. Last version.. PKG install. You have to delete Netflix before with the Triangle option and then delete the folder Npup00030 and ""_cache. Before launching Netflix you have to start multiMAN and then exit after.. You have to do this each Time you reboot or shutdown the PS3.. Maybe i will fix That later..
P.S. You have to have PSN/SEN Enabler or something that give you a PSN connection hope I made a couple of people happy..
Because Netflix is encrypted with keys 4.10, it should run smoothly on CFW 4.x. So CFW 3.55 are once again left aside ... Netflix can not run before because it required a 3.6 and now OFW 4.10 + PSN connection. I have the latest version then re-encrypted for full CFW 3.55 and I have also made ​​a PKG for easy installation So now Netflix can run without problem... To use it you need an account or you can fill out the registration form which will give you 30 days free trial. Netflix should finally arrive in Europe in 2013... It is already available since 2009 for Canada / U.S. / and others... For those who like movies or TV series with Netflix you can choose what you want to watch in HD or SD and the equivalent of 7 euros per month. I hope they keep the price as low for you... For those of France I will make a version 3.55 when Netflix will be available to you. 0. First and foremost you need access to the PSN with the tool of your choice... You can install PSN / SEN Enabler Disabler that will give you access and the console also spoofer 4.31. If you want to install new CFW 3.55 I recommend that you install the Rebug CFW 3.55.3 there a way to spoof the console... 4.31. 1. You must delete all data from Netflix Console For U.S. / CA / UK. (For consoles in Europe (France) Netflix does not seem to be present by default, but it is still advisable to check if the file is present...) As Netflix itself. Netflix to Triangle and then delete. Now to be sure that Netflix is really deleted you must open MultiMAN and go to the file manager, you then go dev_hdd0/GAME / you will now find and delete the folder and the folder NPUP00030 NPUP00030_CACHE. Note that it is possible to install my version above, but it could cause errors if an older version of Netflix was already installed. 2. Install the PKG 01_NetFliX_for355_VSPROD.pkg (linked above). 3. Stage REQUIRED to do each reboot or shutdown the console. MultiMAN You must start and wait until it is completely loaded... Once MultiMAN is open you can close it with the option to leave and return to the XMB. 4. You can now launch Netflix in the Video section of the XMB.